It’s Friday!!! It’s time to Sale-A-Brate again!!!! Today, Stampin’ Up has a Sale-A-Bration 2nd Release!!! Even more fabulous products that you can earn for FREE!!! There are items at the $50 Level as well as the $100 Level!!! 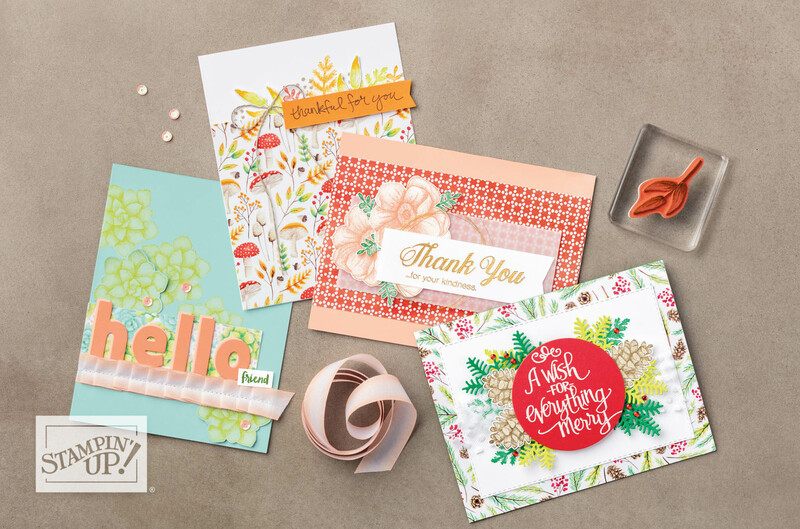 Stamps, Designer Paper, and Embossing Folders…..OH MY!!! I am loving it all! At the $50 Level, you can get the All Adorned Stamp Set which has some fabulous images to create corners and more using the Stamparatus! There is also a Country Floral Embossing Folder and you all know how much I LOVE FLOWERS!!!!! (Yes, I slowly got louder and more excited as I said/typed that!) Eeeee I’m so excited! At the $100 Level, there is a Stamp Set and Designer Paper Bundle called Painted Seasons! It;s fabulous for all year long with a pine cone, flowers, and greenery! One side of the designer paper has a fun seasonal look and the other side of each sheet is a more solid pattern! How amazing is that? LOVE IT! Click here to see all of these items – Sale-A-Bration 2nd Release! Click here to start shopping and earning!!! Have a wonderful weekend and I’ll see you back here on Monday!!! Happy Valentine’s Day!!!! What do you love today?? Is it chocolate? Is it someone in your life? Is it your craft supplies? I’m going to go with the last 2 and I could exchange chocolate for a cupcake! 🙂 Today, I wanted to share what I am loving right now with Stampin’ Up!!! We are right in the middle of Sale-A-Bration and the Occasions Mini Catalog and it’s been fabulous! There is so much amazing product to play with and color combinations I would have never thought to use! There is also fabulous free stuff with every $50 order and additional $25 in Hostess Goodies when your order/party is over $250. The best deal yet though is when you join Stampin’ Up and get $175 in product for just $99! That is an amazing steal! Free shipping on top of that makes it even better! Gather together with some friends and let’s stamp. Then you can use your Hostess goodies towards signing up to make it an even better deal! Today, I’m sharing what I would pick out for my Starter Kit totaling $175!!! 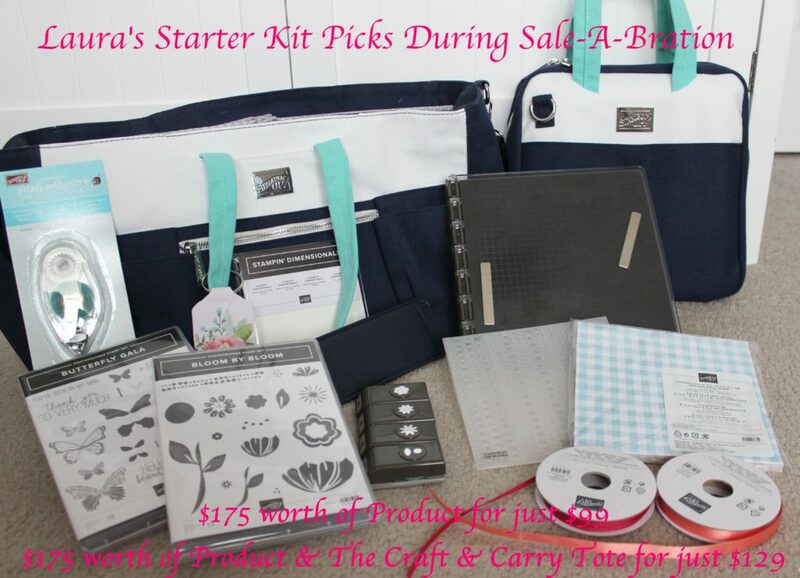 There is also a 2nd option to the kit to add on the Craft Carry Tote Bag for $129 rather than $99! Being the bag lady that I am, I’m going with that option!!! So that’s $175 in any product and the Craft & Carry Tote for just $129! Today, I’m sharing the Orlando Day 2 Recap!!! 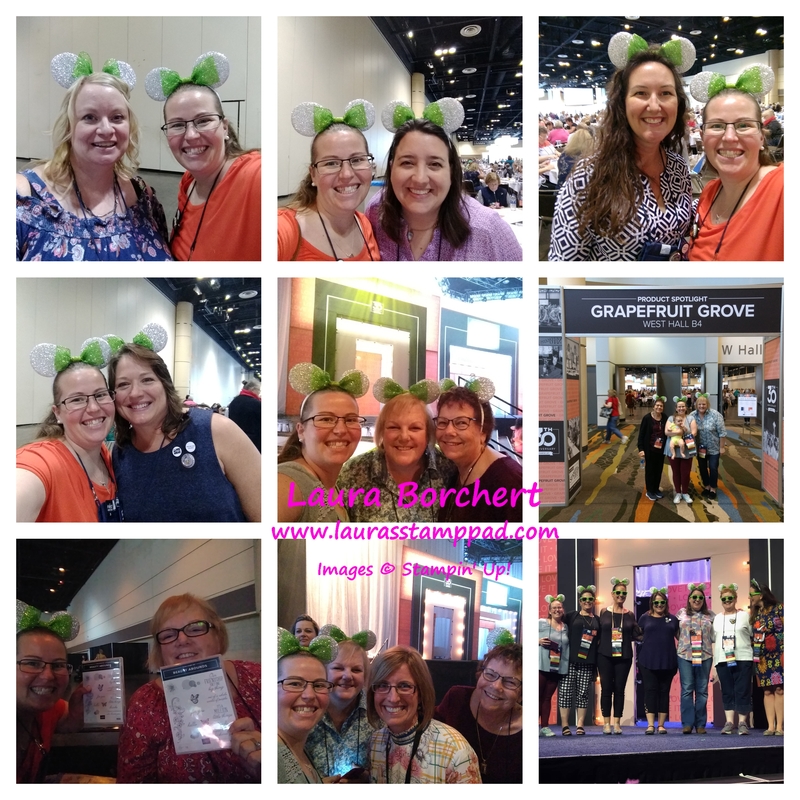 There was a lot more stamping, seeing new products, and winning fabulous stuff on this day!!! 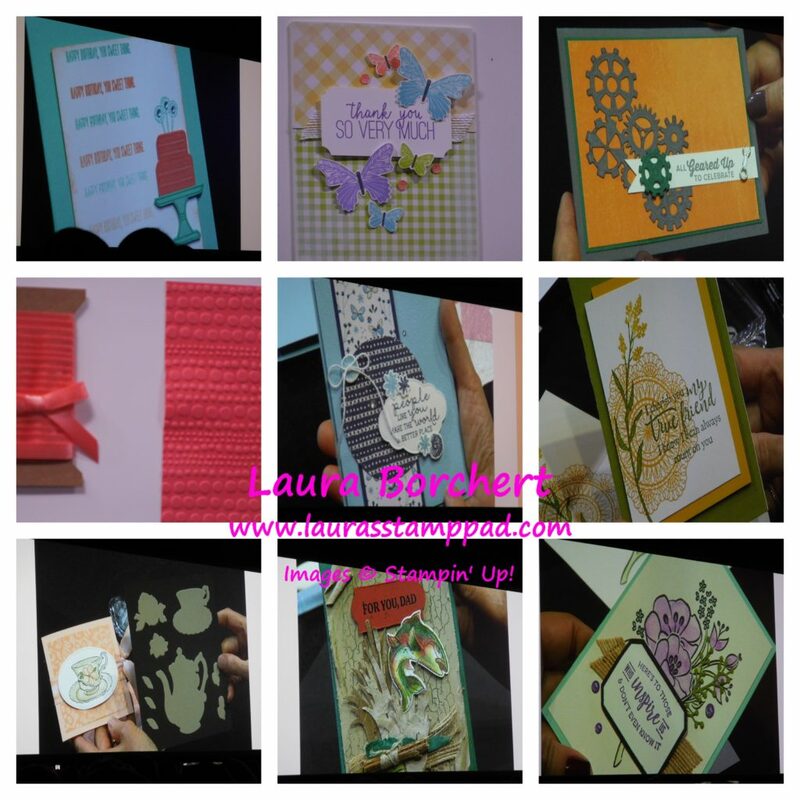 Oh my goodness was I blown away by some of these stamping projects. Shelli’s watercoloring and layering is so amazing and I can only hope to color like that. I did try to take notes on how she does it. I have lots of practice to do! 🙂 There are lots of great masculine sets coming soon and we all know I struggle with man cards. Flowers, flowers, and more flowers make my heart happy!!! While there is a lot of stamping going on, there is also a lot of chatting, meeting new people, snapping photos, and so much more! The people make this even more fabulous! I tried taking pictures with those in my Fabulous Friends Team, LovenStampfuls Team, and ImPECKable Stampers Team. Of course, I got pictures with others too! Meeting new people from all over the world is just amazing. The green ears were for all of our team so we could find each other in the sea of 6000 people. The bottom right photo is me and the 6 other ladies in our team that earned the Greek Isles Trip and we got to walk across stage together. It was AMAZING!!! If you would like to see all the goodies we got, check out the video below or click here! Be sure to give the video a thumbs up if you liked it and don’t forget to subscribe if you are new. If you would like a notification when I post a new video, be sure to click the bell right next to the subscribe!!! We made it home and it’s snowing…..so not cool!!! I am missing Orlando weather already. Here is our Orlando Day 1 Recap!!! 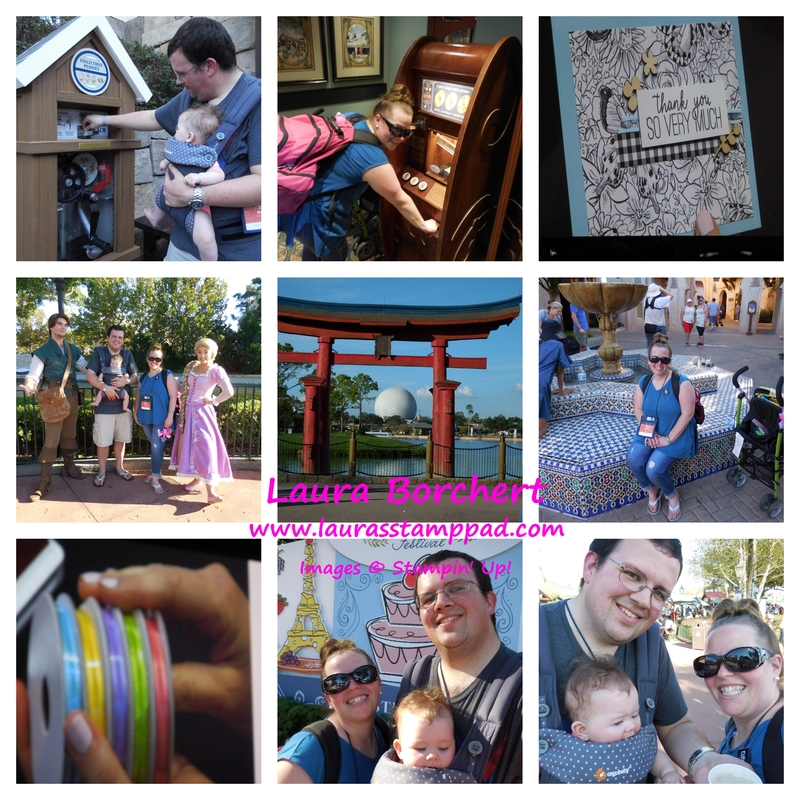 We went to Epcot courtesy of Stampin’ Up and it was amazing!!!! It was super magical and so easy! Parking was a breeze. There was a tram that took us right to the entrance and then it was like we had the whole world in front of us. I remember looking at Brad and saying why does it seem everyone knows where they are going and we are like oh my what do we do first. We headed around the world looking at everything and smashing pennies. We got a total of 19 smashed pennies so of course I had to buy a Disney Penny Passport. Rapunzel and Flynn chatted with us and we got their autograph! Claire did so well and enjoyed looking at everything and everyone. It was HOT like upper 80’s and real feel of mid 90’s! I was loving it!!! 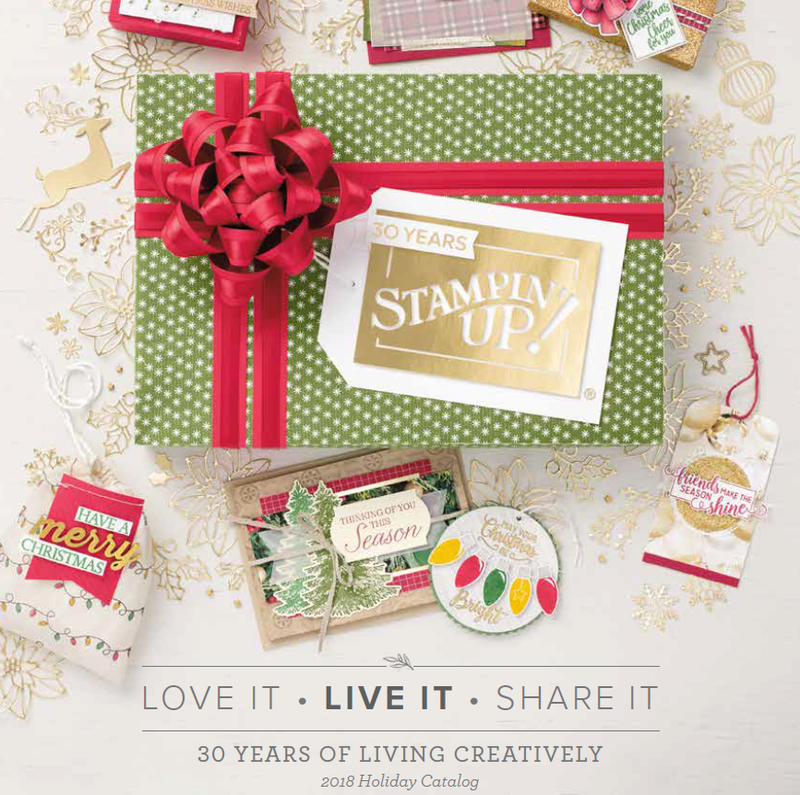 Stampin’ Up released the NEW Occasions Mini Catalog and Sale-A-Bration brochure to all of us. AMAZING!!! My favorite Sale-A-Bration item already is that amazing ribbon. There are 5 spools of the most beautiful spring colors. Butterflies and gingham are hot hot hot too! Check back tomorrow for more samples, ideas, and goodies. I have millions of photos to sort through and all kinds of things! Want to join me on the next Stampin’ Up adventure in April? Join my Fabulous Friends team by clicking here! Happy Friday!!! This week seemed to fly by and can you believe it’s the last Friday of the month! Where did October go??? I thought I would do a little follow-up Friday before we settle into the weekend!!! 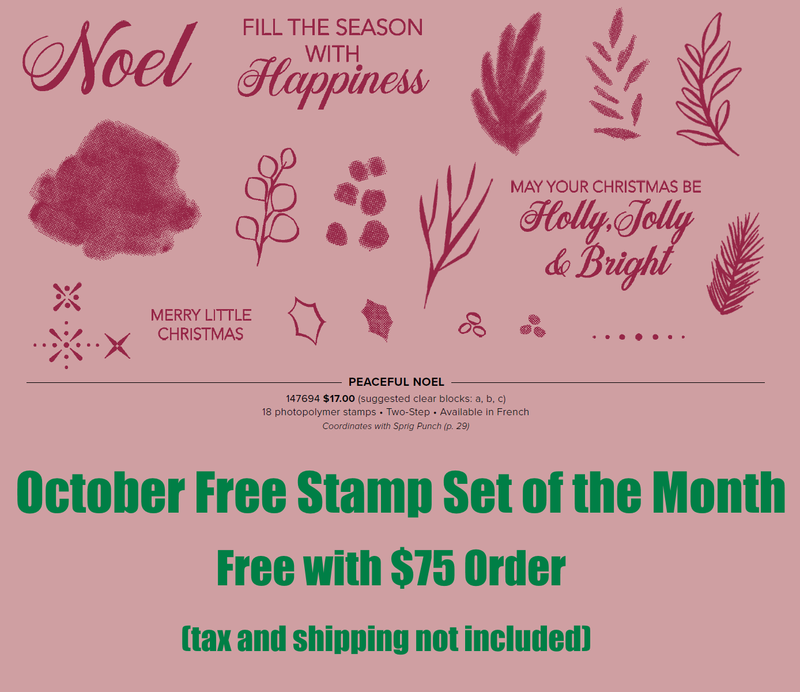 The October Free Stamp Set of the Month is the Peaceful Noel Stamp Set from the Holiday Mini Catalog. You will get this set for Free when you place an order of $75 or more before shipping and tax. This offer is exclusively through me. Also, let me know your vote for the November Free Set of the Month in the comments below! I haven’t picked it yet so I would love to hear your suggestions. Click here to start shopping!!! The November Paper Pumpkin is going to be Holiday/Christmas themed and it will be cards. It is also going to come in this adorable plaid box! I love it!!! Click here to get signed up! Be sure to do it before November 10th!!! You can get Paper Pumpkin for just 1 month to get this fabulous box or you can continue to get it for a few more months. BONUS: Your first kit comes with a clear block! Happy 30th Birthday, Stampin’ Up!!! Guess what today is???? It’s Stampin’ Up’s Birthday!!!! Happy 30th Birthday, Stampin’ Up!!! Lets get this party started!!! 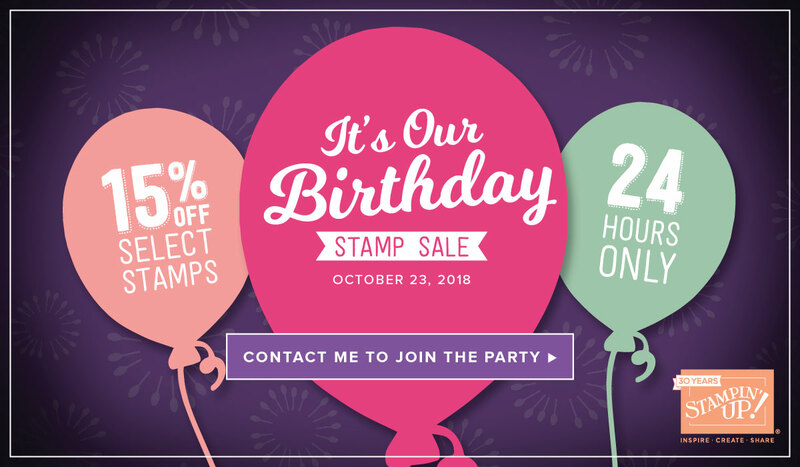 Stampin’ Up is letting us all celebrate with them!!! TODAY ONLY, enjoy 15% select stamp sets. Click here to see the complete list of stamp sets!!! There are a few on there that I own and love like Balloon Celebrations and Sweet Soiree. Check out some samples with those here, here, and here! Then of course there are a few on the list that I don’t own but will after today!!!! On my list, there is the Kindness & Compassion and A Little Wild. Those little animals are just precious and I can’t pass up a good deal. Also, the Kindness & Compassion Stamp Set looks like it is a good one to have on hand! Want to make the most of this amazing offer? 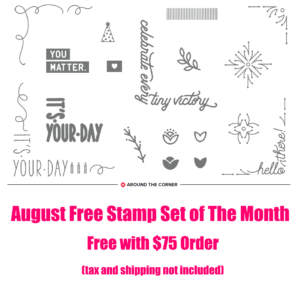 Join Stampin’ Up and pick some of these stamp sets for your Starter Kit! That means you will get even more amazing goodies for an awesome price. When you join, you get to pick out $150 in product and pay just $99 plus tax. There is no shipping! If you select stamp sets in the birthday celebration sale, your $150 goes even farther! Woot Woot!!! Click here for more details! What are some of your favorites on this list? What are some that you already own and love? Let me know in the comments below! Click here to start shopping and celebrating!!! Happy Birthday Stampin’ Up!!! October 2018 Free Stamp Set of the Month!!! All orders placed this month online, via email, or at one of my events of $75 or more (before tax and shipping) will get this set for FREE. 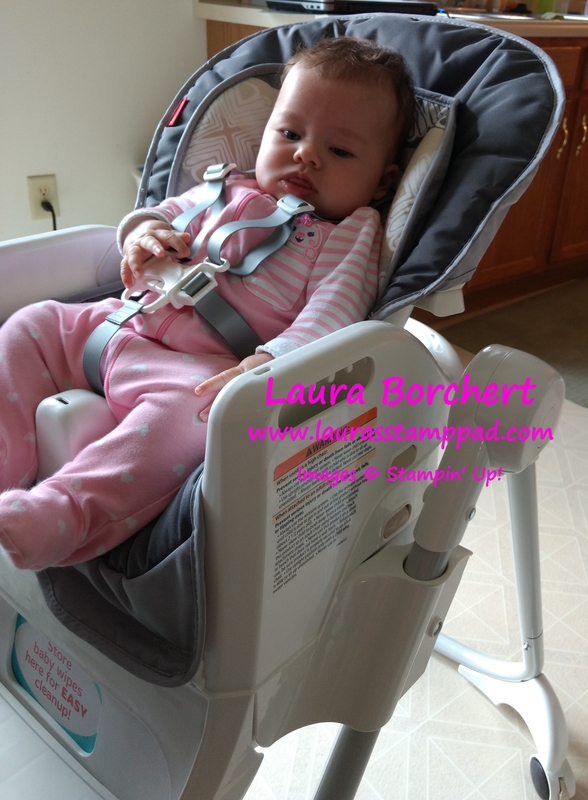 This offer is exclusively through me – Laura Borchert. Click here to start shopping! World Card Making Day 2018!!! Are you ready to celebrate World Card Making Day 2018??? 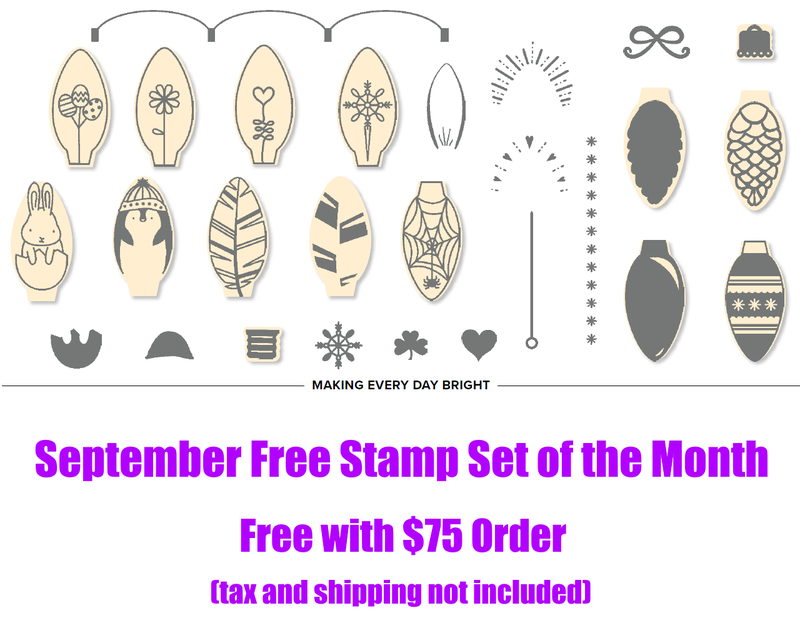 Stampin’ Up has select card making items on sale this week only – October 1st – 7th!!! Let’s celebrate with Stampin’ Dimensionals ON SALE!!!! You bet your bottom dollar I will be stocking up on those. If you have been following me for a hot second, you know I love love love Stampin’ Dimensionals. I’m also super excited about the fact that there are All Inclusive Card Kits on sale. These are awesome to give as gifts because they include everything you need to create the cards in the kit. Anyone could do these kits. Don’t forget about the Holidays coming up as well! Check out all of the goodies on sale by clicking here! Happy Friday!!! Today, I thought I would do a little Follow-Up Friday with everything going on this month!!! The Holiday Mini Catalog is officially here and available to order! Click here to start shopping! I am loving the Country Lane Suite and Frosted Floral Suite. Also, the Tin Tile Embossing Folder is probably my favorite item out there so far!!! What’s your favorite?? Let me know in the comments below! The Free Stamp Set of the Month for September is the Making Every Day Bright from the Holiday Mini Catalog! This coordinates with the Christmas Bulb Builder Punch. Every order of $75 or more before tax and shipping will earn this set from me!!! This offer is exclusive through me! 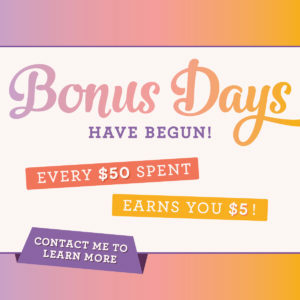 Did you earn Bonus Bucks in August??? Be sure to use those this month as they expire on September 30th. If you have any questions on how to redeem the codes on your order, just reach out. I’m always happy to help! And because she’s so darn cute…here’s a picture of Miss Claire getting so big. She loves sitting in her highchair while we are in the kitchen cooking or eating a meal. She likes to sit up and play with toys on the tray. Baby girl is growing so much and will be 16 weeks on Monday. Crazy! Happy Friday!!! It’s the Holiday Weekend and I’m super pumped because we have a weekend filled with family time!!! Before we get started on this weekend, I wanted to remind you that it’s the last day of August. That means there are a few promotions ending and a few starting tomorrow!!! First, let’s discuss what you need to do TODAY before you miss out! 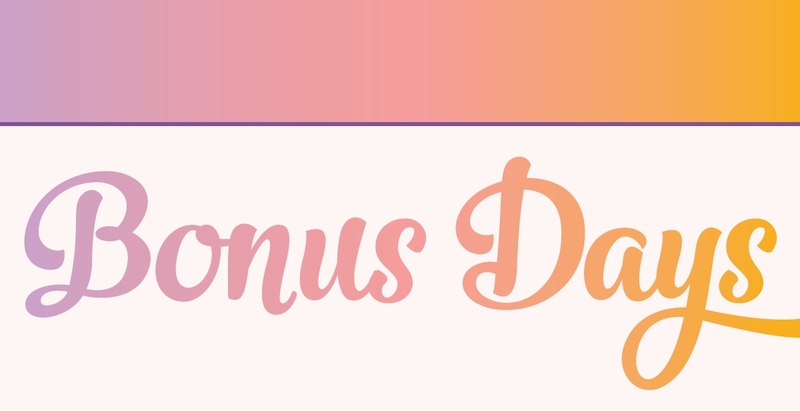 Bonus Days end today!!! 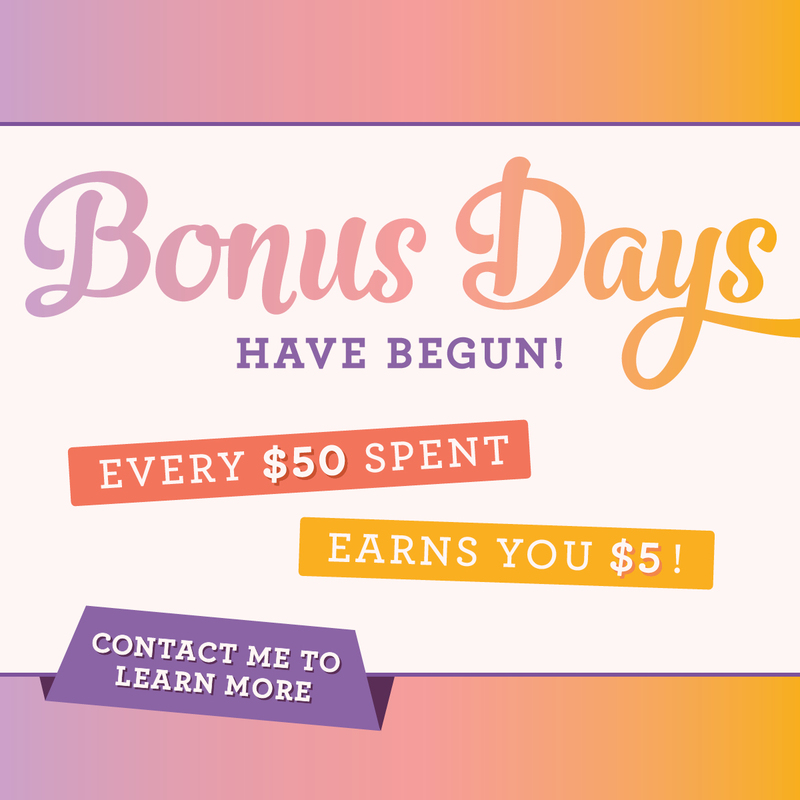 That means for every $50 you spend today, you will earn a $5 coupon code to use starting tomorrow!!! This is for increments of $50 so there is no cap on how many you can earn! Click here to start shopping! Today is the last day to purchase the Blended Seasons Stamp Set and Stitched Seasons Framelits. You can check out samples using these amazing products by clicking here, here, and here! I love this stamp set because it has something for every season and occasion. If you feel like you already have stamps like this so you can pass this bundle up, get just the framelits. These Framelits are AMAZING! They create a stitched look along the label and along the outside negative image. That means you get 2 amazing pieces with every crank through the Big Shot. There is also a leaf, a bow, and flower image in there too! Click here to shop these products! They will no longer be available after today! 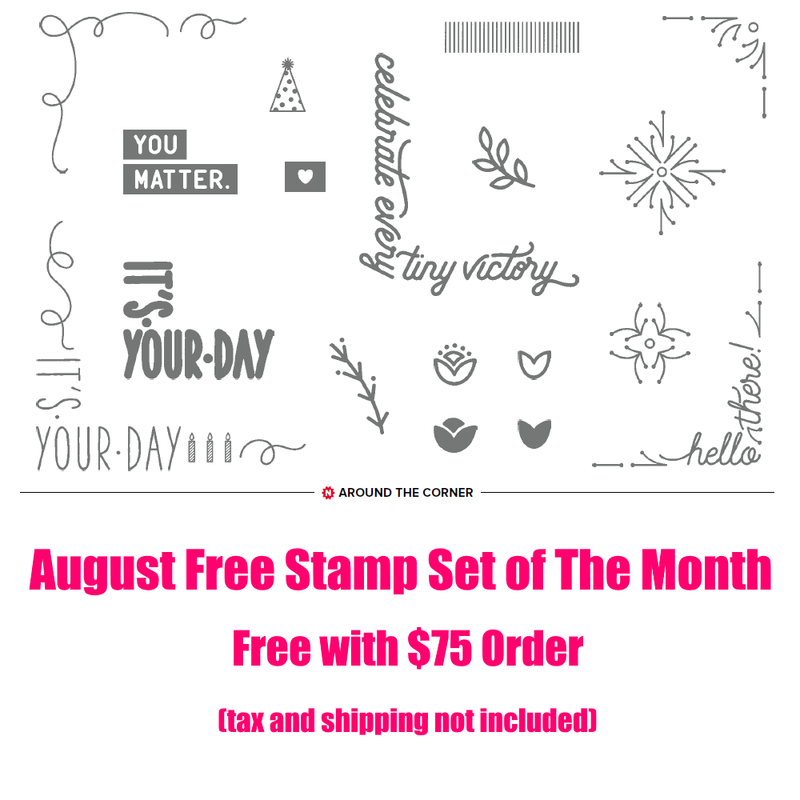 Today is the last day to earn the Around the Corner August Free Stamp Set that I am offering for orders of $75 or more before tax and shipping. This is just my little way of saying Thank You for your order!!! 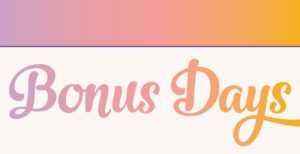 Stay tuned for all the fun in September including a Hostess Promotion, redeeming those Bonus Bucks, and the Holiday Mini Catalog all coming out next month! Woot Woot!!! I hope you have an amazing weekend and stay safe! See you back here on Monday!